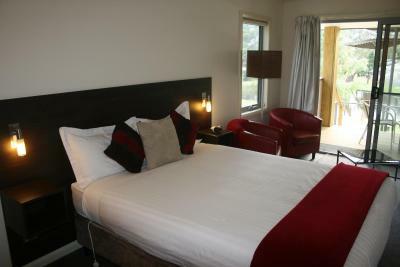 Lock in a great price for Bicheno by the Bay – rated 8.7 by recent guests! 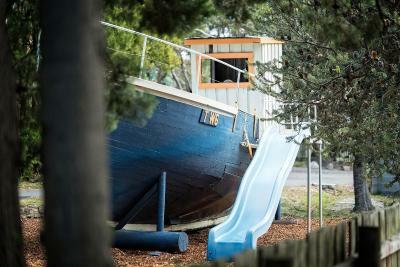 Roomy cabin in an ideal location, easy walking distance from seaside restaurants and the shore. Easy Checking in & out. Location is great, just few minutes' drive to Blowhole. Decoration inside the house is great. Covered parking space is provided and help me a lot during heavy raining. Surrounding is pretty. Great view and location. Cute lodge for a short stay. I liked the closenesd to the penguins and it was quite! We stayed in Radiata The position was fabulous - we looked out at the blow hole from the front desk of the chalet , and could walk easily to the local shops The cabin was spacious and well modernized . Very comfortable . We stayed in a standalone two storey villa named "Castaway" with car space right at the front door. One bedroom on the ground floor with the other two bedrooms, living room and kitchen upstairs. With additional bathroom and two separate toilets, it was perfect for our party of 5. Located on high ground close to the coastline we had a good view of the occean. It was cold and windy outside but the air conditioning indoors kept us comfortable indoors. The property had a washer but no dryer. Kitchen facilities were good. TV reception was good, complimentary WiFi was good. Good location to town and blowhole. Wi fi was advertised but was non existent.Tv reception was about 10%.Reception was ok but unable to help.Bathroom light was blown but no one available to fix it. Bicheno by the Bay This rating is a reflection of how the property compares to the industry standard when it comes to price, facilities and services available. It's based on a self-evaluation by the property. Use this rating to help choose your stay! 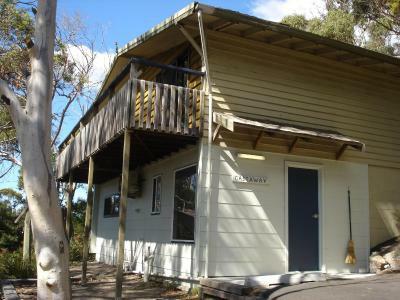 Bicheno by the Bay offers self-contained holiday cottages, most with Tasman Sea views. 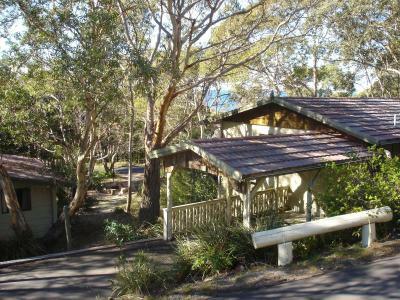 Surrounded by native bushland, Bicheno by the Bay Tasmania is a 3-minute walk from Bicheno town center, the Blowhole, Whalers Lookout and the Foreshore Footway. 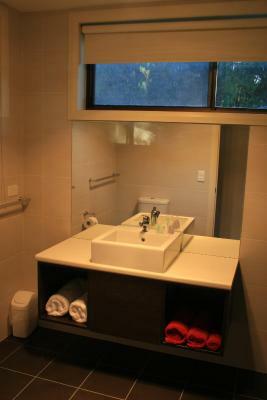 Each of the free-standing timber bungalows has their own kitchen, bathroom, separate bedrooms and lounge room. All have a private terrace off the lounge room and main bedroom. The motel-style rooms include electric blankets, heating, flat-screen TV and DVD player. Each has a spacious modern bathroom with shower, plus a private terrace. 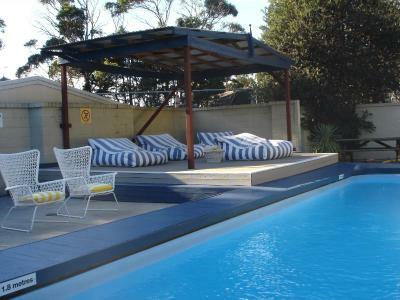 Facilities include a heated outdoor pool, full-size tennis court and a children’s playground. When would you like to stay at Bicheno by the Bay? These spacious, 1-bedroom bungalows have views of either the ocean or the pool. There is a fully equipped kitchen, bathroom, lounge/dining room, queen-sized bed, private veranda, bathroom and covered parking at your door. These 2-bedroom bungalows overlook the bush or ocean. It includes a queen-sized bed and 2 or 3 single-sized beds as well as a fully equipped kitchen, bathroom, lounge/dining room, private veranda and covered parking at your door. This bungalow includes a queen-sized bed, 4 single-sized bed, a fully equipped kitchen, 2 bathrooms, a lounge/dining room, private veranda and parking at your door. This bungalow includes a king-sized bed, queen-sized bed and 5 single-sized beds. It also includes a fully equipped kitchen, bathroom, lounge/dining room, private vernadah and covered car parking at your door. This room includes tranquil views over man-made duck pond, a queen-sized bed, heating, flat-screen TV, DVD player, walk-in shower, tea/coffee making facilities and a toaster. House Rules Bicheno by the Bay takes special requests – add in the next step! Bicheno by the Bay accepts these cards and reserves the right to temporarily hold an amount prior to arrival. Please advise the property of the number of adults and children staying. You can use the Special Requests box when booking, or contact the property using the contact details found on the booking confirmation. Please inform Bicheno by the Bay of your expected arrival time in advance. You can use the Special Requests box when booking, or contact the property directly using the contact details in your confirmation. Dishwasing in a separate space. Good, peaceful location. Nice outside deck to sit in the evenings. We arrived at 4:00pm and no one was at reception - they left a key in an envelope for us. Beautiful and spacious beach house and view, very comfy beds, good shower. There was no heating in the bedrooms although the bedding was adequate for a warm nights sleep. Very nice accommodation for our two night stay. Great location close to shops and a short walk to the seaside. Individual cabin with lounge, kitchen and laundry. Amazing views to the sea. We could have happily just sat on the veranda and watched the view all day. Fabulous. 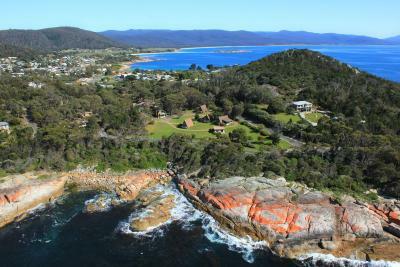 Great location, Bicheno is lovely with nice coastal walks and various wildlife tours. Heaters in every room would be great as it gets quite cold. Balcony and the views were great. the room (3) had a skylight I couldn’t figure out how to close properly... a minor inconvenience but I do prefer a fully dark room. Large room in the ‘motel’ section overlooking the adorable canoe pond. Check in was easy and I was provided a map of Bicheno and recommended places to eat- many places close before 7pm here, IGA at 6pm- it’s about a 2 minute walk to the ‘centre’ of town. The bathroom appeared recently done up and stocked with the ‘usual’ ammenities. Bed was large and quite comfy for the night. Electronic blanket included which would be useful come winter I imagine. Having a microwave in the laundry was odd. So too was the need to wash dishes there. Didn’t discover microwave until the second day. Room was lovely. Fantastic bathroom. Very clean. Great value. Great to have access to a good laundry. The superb accommodation offered at Leatherwood provided every facility with a touch of home. The staff were very friendly and helpful, to location is ideal and and the environmental setting is beautiful.